A couple of months ago, I made a spur of the moment decision to break the lease on my two-bedroom north side apartment, sell almost all of my furniture and move into a one-bedroom apartment in Fortitude Valley. This was one of my best decisions for many reasons, most of all because it’s thrown me back into Brisbane’s social scene and I’ve relished the opportunity to work my way around my local bars and restaurants (of which there are many!). 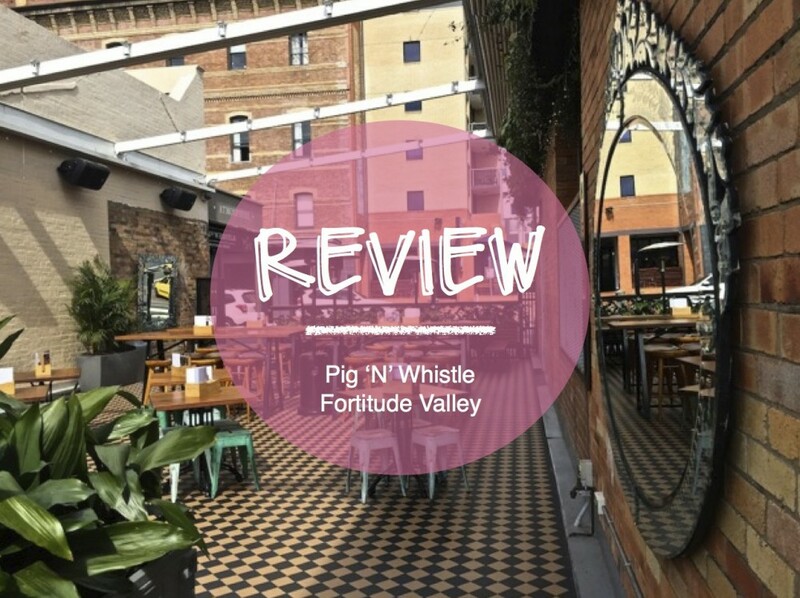 Among my favourites is Pig ‘N’ Whistle on Brunswick Street because, to steal the words of a mate, “you could drop it into New York’s meatpacking district and it wouldn’t look out-of-place” thanks to its twinkling fairy lights, exposed brick walls, Venetian glass mirrors and sleek wooden furniture. Since opening last year, the venue has built up a strong following, not just for its swish look and great selection of drinks (the upstairs bar has 18 beers on tap and two old-school English pump taps serving authentic British ales and they have a wine cellar which boast a wide selection of Australia and New Zealand wines) but they’ve also got live music five nights a week. Located on the corner of Brunswick and Robertson Sts, the heritage-listed building used to be home to iconic Brisbane restaurants Ortiga and Isis so if the walls could talk I’m sure they’d share some amazing recipes. On Thursday night, I swung past for drinks and dinner with a date and, given the balmy weather, we settled in to the upstairs courtyard where we could enjoy the music of the soloist performing just inside the bar. Having opted for a light lunch earlier that day, I was pretty hungry by the time dinner rolled around and, with eyes bigger than my stomach, I ended up ordering enough off the bar menu for four people. 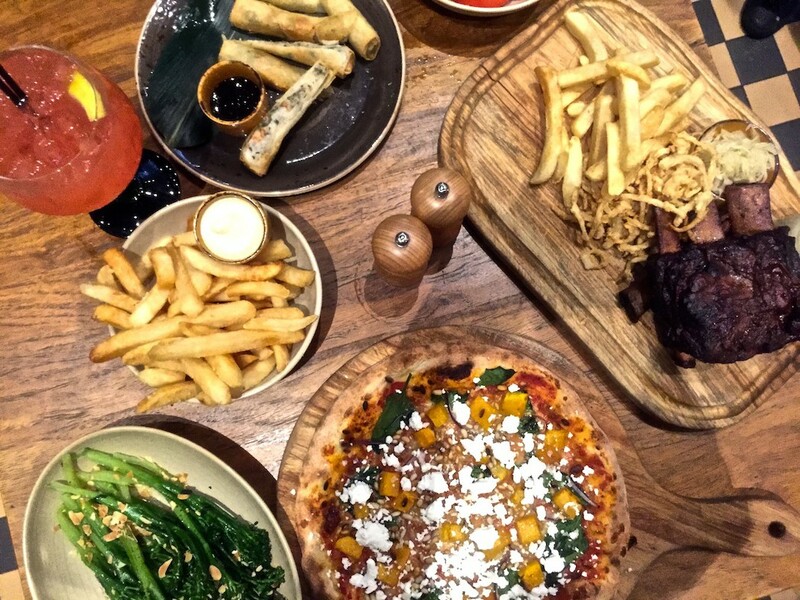 We shared the Alla Zucca pizza with roasted pumpkin, goat’s cheese, spinach, mozzarella, pine nuts and red onion ($20), Barramundi and Prawn Spring Rolls with black garlic dipping sauce ($17) and Meaty Beef Short Ribs with sauerkraut, chips, crispy fried onion ($33). To balance things out, we shared the Tomato & buffalo mozzarella salad with caramelised balsamic reduction & fresh basil ($9) and Steamed broccolini, beurre noisette & toasted slivered almonds ($9). I was keen to try the grilled corn with rosemary butter, fresh parmesan ($9) but they’d sold out. Everything we ordered was delicious and I’d highly recommend it all, although the barramundi and prawn spring rolls were pretty amazing and, as a spring roll connoisseur, they definitely left me wanting more. I’m also pretty partial to ribs (although not my own as I haven’t seen them for some time), and these didn’t disappoint with the beef cooked to perfection, easily sliding off the bone and melting in my mouth. This is one of the most tempting pub menus I have seen in a while. Tomato & buffalo mozzarella salad, caramelised balsamic reduction & fresh basil. The Alla Zucca … Roasted pumpkin, goat’s cheese, spinach, mozzarella, pine nuts, red onion. Twinkle, twinkle, little star … can you point me to the bar? The downstairs beer garden/garage bar has 8 beers and 4 wines on tap! What I wore … Sportsgirl jacket and singlet, Witchery jeans and Saba heels. If you’re looking for somewhere to hang out this summer, Pig ‘N’ Whistle Brunswick Street also boasts a large downstairs beer garden along with the cool underground Garage Bar, which boasts eight craft beers and four craft wines on tap. If you see me there and you’re heading to the bar, I’ll have a vodka and lemonade please! Pig ‘N’ Whistle on Brunswick Street offers lunch and dinner seven days a week as well as breakfasts on weekends.